Much of Calderdale is veiled in snow. West Yorkshire Police have this morning issued a warning to Calderdale's cross-Pennine commuters, advising against travelling unless it is absolutely necessary. Calderdale Highways have implored motorists to ignore Sat Nav advice and follow the indicated diversions. Anybody living on the Black Circle diversion has been asked to move their cars from the roadside wherever possible in order to ease congestion. "Members of the public are being advised that disruption to cross-Pennine routes is expected in to today’s rush hour (Friday, 2 March) and people are being advised to avoid travelling unless necessary. "The M62 was closed yesterday evening (Thursday, 1 March) westbound between junctions 24 at Ainley Top and 21 at Milnrow and eastbound between junctions 20 at Rochdale and 22 at Saddleworth. There have also been significant issues overnight on a number of other roads in the vicinity, including the A62, the A618 and the A66. "The closures have been put in place due to high winds and snow. "Highways England, Greater Manchester Police and West Yorkshire Police have been working with local authorities and other emergency services to assist and move traffic affected by these closures. 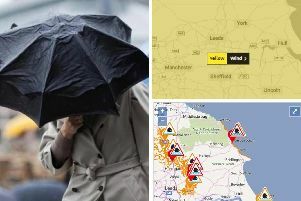 "It is anticipated that a number of road closures will remain in place this morning and the police and Highways England are urging people to consider carefully whether their journey is essential and check the latest traffic information before travelling. In particular, there will be no suitable cross-Pennine routes until weather conditions have eased. "Live updates are available on the Highways England Twitter accounts by following @HighwaysNEAST and @HighwaysNWEST."